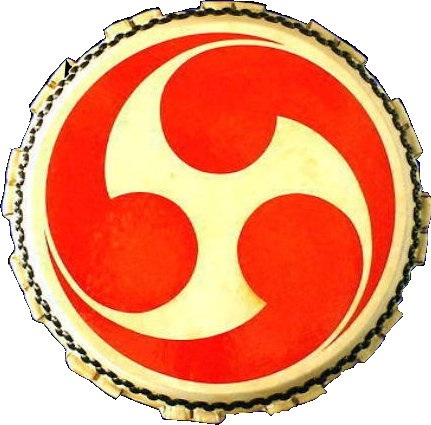 The Japanese tomoe resembles the national solar symbol of the Buryat people, still seen in the national flag of Buryatia, this belies ancient connections between Japan and Northern and/ Central Asia with proven shared genetic traits with Buryat peoples in ancient times. The flag of Ust-Orda Buryat Okrug, in the Russian Federation, is a blue field charged with a white argabar sun emblem within a golden disc. The disc is surrounded with four golden bezants at the cardinal positions. 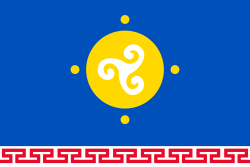 At the bottom of the flag is a white band charged with a red meandr ornament, which symbolizes the lifestyle in the past and a prosperous future for the Buryat tribes. The blue symbolizes the sky. The white symbolizes cleanness and the heavens. The red symbolizes bravery, fire, warmth, the sun, and blood. The gold symbolizes the light of the sun, richness, and happiness.